Today’s post is our third visit to Rob Carver’s book Smart Portfolios. 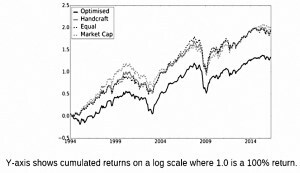 Chapter Four of Rob’s book describes some “simple, smart and safe” methods to find the best portfolio (ignoring costs). 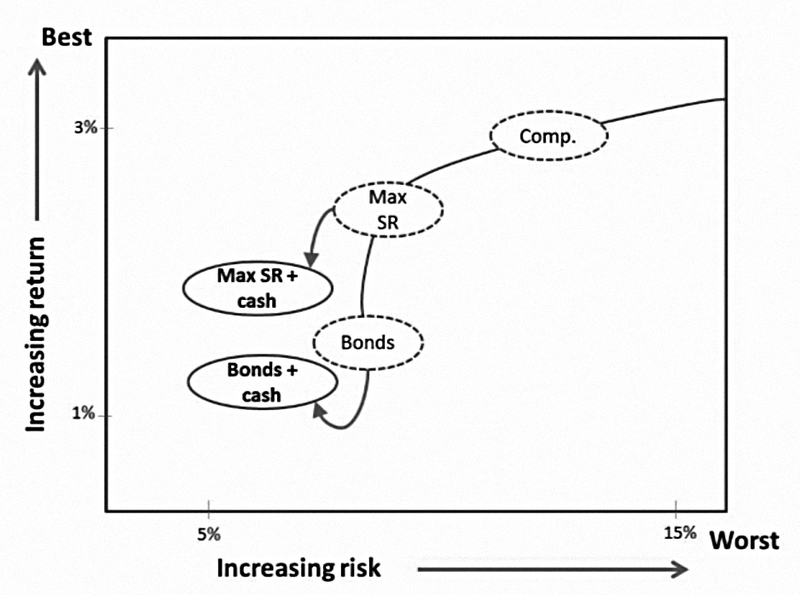 He starts by looking at different levels of risk appetite. We have a Risk Tolerance Questionnaire if you’d like to find out yours. 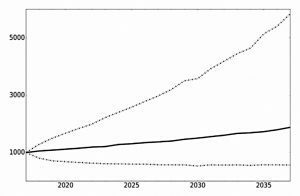 Alternatively, a good rule of thumb is to assume that equities will fall by 40% (at least) once in your investing lifetime. If you know how much you would be able to let your portfolio fall without selling, you know what your ceiling on equities (the most volatile asset class) is. For example, if you could tolerate a 20% loss, you can’t have more than 50% in equities. Rob admits that mapping these portfolios to individuals is not easy, because investors worry more about maximum losses, or the chance of losses (see my rule of thumb above). So he uses the bootstrapping technique to work out the probability of a portfolio doing well or losing money. 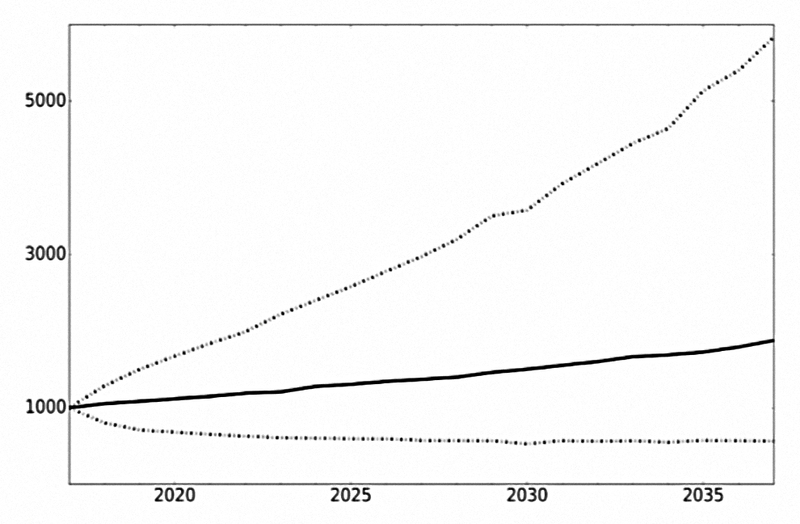 The grey area is the percentage of simulations that a portfolio is negative after 20 years. 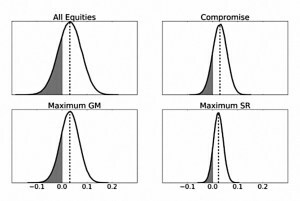 The all equities portfolio has the same mean as the max GM portfolio, but a much bigger negative tail, and a 25% chance of being negative after 20 years. This is because adding 20% of bonds makes no difference to the mean but reduces the volatility. Things are much worse when Rob repeats the analysis over only five years of returns. To be fair, even the Max SR portfolio has an 11% chance of being negative. Rob has three portfolios, but identifies five types of investor. I’ll be focusing on the three higher risk investor types – particularly the medium and high risk types – but will sometimes mention the other two in passing. For the very low risk investors, even the max SR portfolio is too racy. Rob recommends putting some money in the max SR and keeping the rest in cash. The table shows how to use the Max SR to achieve the same volatility as a 72% bond portfolio, but with higher returns. Rob next replaces “safe” cash with treasury bills, to mimic the effect of inflation. This hits returns slightly, but they are still way above the 72% bonds portfolio. Note also that in the third row the 100% risky cash option has miserable returns but retains more than 60% of the volatility of the best option (row two). The low risk investor uses the max SR portfolio to return 2.3% with volatility of 8.7%. 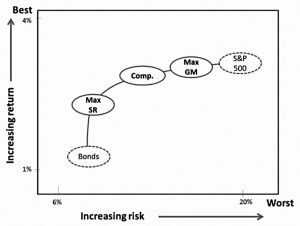 The medium risk investor uses the 60/40 compromise portfolio. The high risk investor uses the max return portfolio (80/20 rather than all equity). 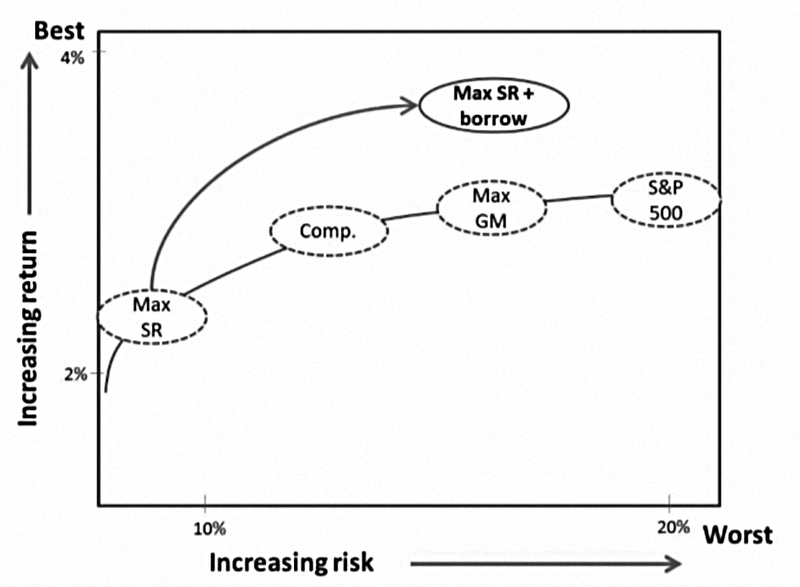 The Borrower should leverage the max SR portfolio. Rob assumes a real interest rate of zero but says that the maths makes sense up to a real rate of 0.75%. I have my doubts that such rates are readily available to the typical private investor, so I would not examine the borrower in as much detail as the medium and high risk investors. That is not to say that I will never incidentally use leverage (for example via spread bets or options). Methods for getting leverage include: portfolio margin (borrowing against the value of the portfolio), UK spread bets, futures, contracts for difference, and buying internally leveraged collective investments. In practice, Rob does not discuss leveraged portfolios any further in this book. Rob brings back his table of expected future returns, but with an extra row describing a “safer bond”. My offer is to exchange the 10 year bond we’ve been using for this new, safer bond. 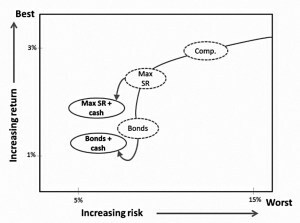 The safer bond has a quarter of the risk of the original bond. Even better, it has a higher geometric Sharpe Ratio! An ultra careful investor should definitely take this offer, as should a leveraged investor who is willing to borrow. 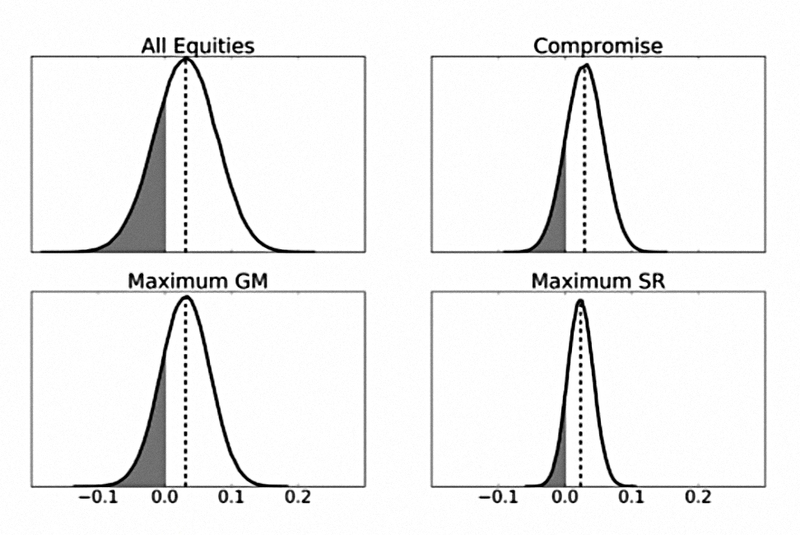 However if you are investing in the compromise or maximum geometric mean portfolio then this is a very bad idea: the lower returns make the safer bond less attractive even with a higher Sharpe. 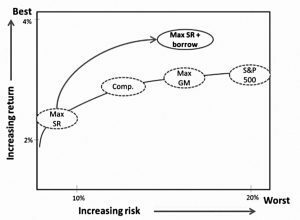 It turns out that even the low risk investor using the max SR portfolio should reject the offer. If (in the third row) you match the return of the original max SR portfolio (top row) then the volatility is higher. If (in the bottom row) you match the volatility, then the return is lower. The safer bond max SR (row two) has a higher SR than the original max SR, but the low return counts for more than the lower volatility. 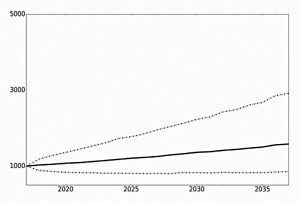 If leverage were available at the risk-free rate, we could get around this (the borrower option – though a max SR investor probably wouldn’t want to do this). Rob recommends that investors avoid low-risk (low-return) assets. For example, he prefers long maturity bonds (at least five years) to short ones. He would also add corporate and emerging market bonds to a government bond allocation. He rules out a higher equity allocation (row three, too much risk) and the use of leveraged ETFs (which are expensive and have damaging daily resets, as well as counterparty and liquidity risk). 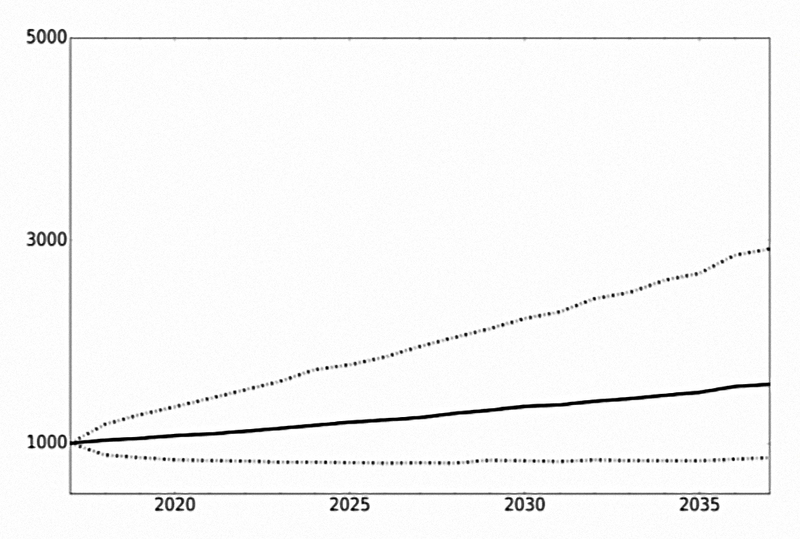 The next section looks at risk weighting as a solution to the problems we’ve met so far. He starts with portfolio 8, which has the uncorrelated assets, one of which (C) has more risk. To calculate risk weightings in this example I first had to normalise all the returns for every asset so they have the same standard deviation, but without changing their geometric Sharpe Ratio. The calculation involved isn’t always straightforward, because of the non-linear relationship between arithmetic means and geometric Sharpe Ratios, but you won’t need to do this yourself, so relax. The handcrafting method explained below gets around the calculation. I now have a portfolio with equal geometric means, equal standard deviations and identical correlations. We already know what the optimiser will do with this (remember portfolio 1 and portfolio 2). It will produce equal weights. Rob then converts the risk weights back to cash weights. You’ve probably noticed that the cash weights in the final column are almost identical to those in portfolio 8. 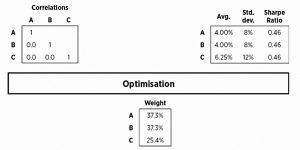 For correlations which aren’t too high the risk weighting method will produce very similar weights to those you’d get from optimising cash weights. Risk weightings are safer when correlations are high. Remember portfolio 5? There we saw extreme weights with only a small difference in volatility; something that wouldn’t happen using the risk weighting method. In the first stage of the process you pretend that all assets have the same volatility, and work out which risk weights will give you the best portfolio. 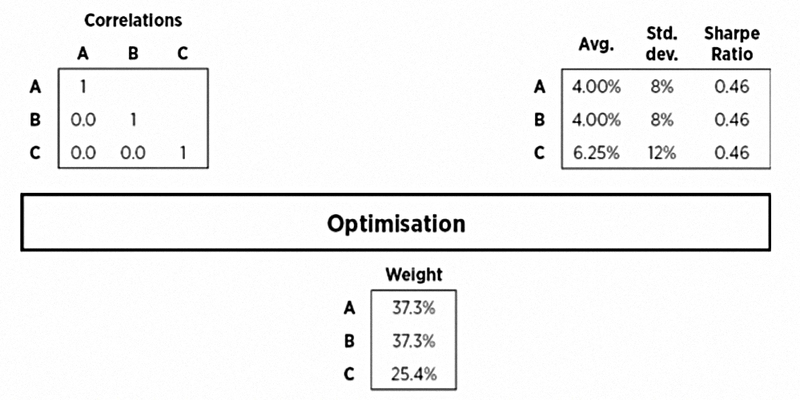 The process of converting from risk weights to cash weights is explained in the table. Suggested values to use [for the volatility target] are: the average volatility across assets, the highest volatility or the lowest volatility. My personal preference is to use a very simple technique which involves abandoning formal portfolio optimisation entirely whilst still producing very credible portfolio weights. This is a top-down method that Rob calls handcrafting. The sequence (for equities) is: asset, country, industry, stock. Other assets might have different categories below the top level. You also need to decide on implementation (eg. ETFs vs stocks) to optimise the trade-off between diversification and cost. Rob explains with an example using US stocks, UK stocks and US bonds. This is the same as Portfolio 3, which we discussed in the previous article. Which is very close to the optimised portfolio. 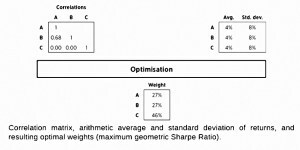 The expected Sharpe Ratios from the handcrafted and the properly optimised weights will be extremely similar; 0.713 for the optimised weights and 0.710 for the handcrafted version. Because geometric Sharpe Ratios are equal, and standard deviations are identical (risk weighting), the correlation alone determines the optimal portfolio weights. Remember that these are risk weightings and I’d need to convert them into cash weightings. The hand-crafting method creates the max SR portfolio (assuming equal correlations within a group), which Rob calls an advantage. But at this point I don’t know how to derive the max return portfolio using handcrafting. If group sizes are radically different, larger groups should be over-weighted. There is a similar problem is correlations within the different groups vary widely. Rob promises a fix later in the book (in an Appendix, actually). Rob’s method produces volatility parity allocations, which are close to those used by risk parity funds. Risk parity funds also account for internal diversification within each asset class, to make sure that the amount of risk coming from each asset class is the same. They are also leveraged to compensate for the low risk / low return that comes with a high bond allocation. Rob thinks that most of the issues with / criticism of risk parity funds relates to the use of leverage. There is also the high bond allocation to think of (which means low returns and comes at the end of a 30-year bull market in bonds), but Rob defends this on the basis of their low volatility. For me Risk Parity / Volatility Parity is somewhat academic – max SR portfolios don’t have high enough returns, and I don’t have access to leverage at a low-enough interest rate to be a Borrower. What I need to discover is how the hand-crafting method applies to the compromise and max return portfolios. So far all I know is that hand-crafting supports top-down constraints, so I could set a maximum bond allocation of 20%, for example. This is pretty much my current approach to asset allocation. In the next section, Rob confirms that this is the way to go. Set a (risk) weight to the lowest risk group. Rob suggests a 10% risk weighting for the max return portfolio, which should translate into a 20% cash weight. 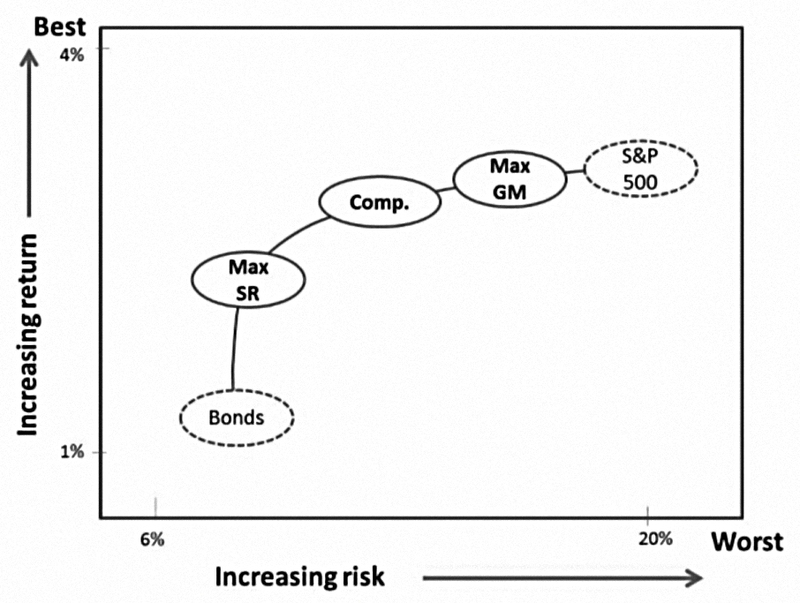 For the compromise portfolio, you could go as high as 30% risk to the low-risk asset. And there’s more to come on this topic in a later chapter. Rob tries to reassure readers that – for developed markets at least – the hand-crafting process won’t expose them to massive embarrassment on the basis of large deviations from market cap. For example, the US is 94% of the North America group, but hand-crafting would have you allocate 50/50 with Canada. The chart shows that all methods of allocation (equal, handcraft, market cap) produce similar results across 22 developed markets and all easily beat a formally optimised portfolio. That said, I’m unlikely in practice to allocate equally to the US and Canada. I’m more likely to ignore Canada entirely, by using a cheap S&P 500 ETF. The best I might do for Canada is to use a North American ETF instead. Rob admits that some kinds of assets include less predictable risk (he calls it “risky risk”) that isn’t captured by standard deviation. Emerging markets, thrilling tech and biotech stocks, and certain types of alternative assets are amongst the worst offenders, along with high yield junk bonds. These toxic assets tend to have long periods of relatively subdued risk, but then their returns suddenly become much more volatile; often almost overnight and without warning. As well as being unpredictable, the risk profile of these assets isn’t pleasant. They have evil distributions where steep falls in price are much more common than a Gaussian distribution would expect. They have negative skew, and a high kurtosis (fat tails). So I’d allocate less to these unpleasant assets than I would if their risk was more predictable and benign. You should be fairly relaxed about using the handcrafting method in any sensible way. Use my suggested groups and weightings, or choose your own. Do not get stressed about getting the grouping or weights `correct’: there is no single correct solution. Feel free to move away from strict equal weighting within groups if you feel it is justified. The handcrafting process is not there so you can blindly copy my suggested portfolio weights, but to give you a logical and systematic framework to build portfolios whilst incorporating your own views and opinions. It’s been another interesting section of the book, but I must admit to a slight feeling of disappointment at the end of it. 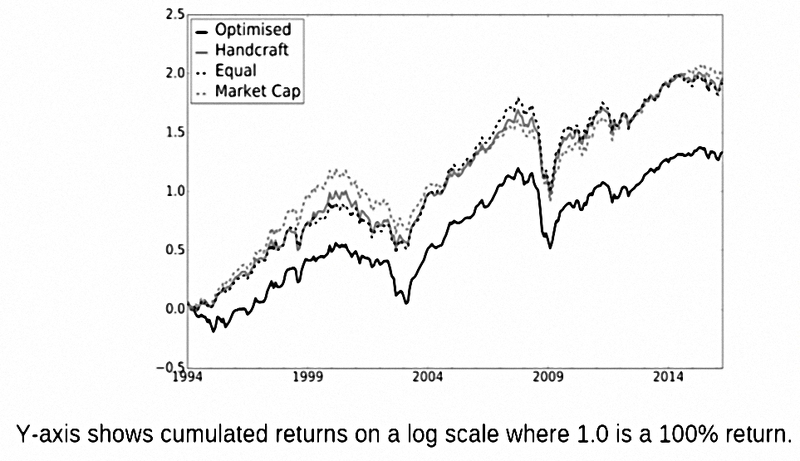 The “systematic” hand-crafting process leads directly to the max SR portfolio. The returns from this portfolio are too low for my purposes, and to produce the max returns portfolio that I am after requires a fair amount of top-down human judgement. I have no issue with this in principle, but in practice it brings the asset allocation process back towards the one I have been using for almost three decades. At this point, the 134 (dense) pages of the book that I have read leave me pretty much where I started. But there’s a lot more of the book to get through.